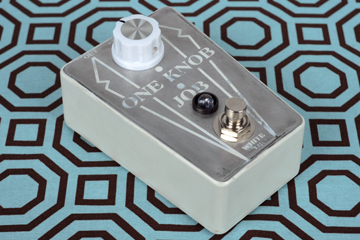 The One Knob Job – White Tie is a dirty boost designed to keep the character of both your guitar and amp intact. The single knob controls the output of circuit. The gain of the box is dependent on whatever you’ve got in front of it. Cleans up remarkably well with your guitar’s volume control. In comparison to the Black Tie, the White Tie is more over-the-top fuzzy, squishy, and (in some circumstances) glitchy.